An intelligent label that listens and talks could increase productivity throughout the supply chain. 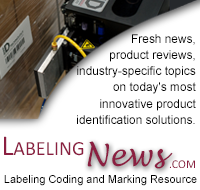 How does this new technology stack up to bar code labels? Labels that “talk”? That may sound a little far fetched to people who have been using bar code technology. For years, bar code technology has been the standard means of identifying or tracking a product on its journey through the supply chain. But now, a new intelligent label with proven radio frequency identification (RFID) technology is just one step shy of actually speaking. The new intelligent label combines RFID and bar code technologies. It offers two-way data communication (talk and listen capabilities); and now, the size of the parts that talk and listen is shrinking. The intelligent label is now small enough to fit between the face sheet and liner of a standard bar code label. It can even run through bar code printers and be printed with traditional bar code information. The new intelligent label remains compatible with a company’s existing bar code system products, including printers, scanners, software and supplies. What makes intelligent labels smart? The intelligent label is a device built into a pressure-sensitive label that transmits, receives and stores data. The intelligent label also contains electronic elements, including an RFID microchip, an antenna and a substrate (the medium to which the chip and antenna are attached). The RFID chip is a paper-thin memory device about the same size as the head of a pin. The chip is much like a tiny PC floppy disk on which data can be stored, retrieved or even changed. The chip requires no batteries. Instead, it is powered by the external radio waves of a scanner of interrogator. Attached to the chip is a miniature radio antenna. When energized by the external scanner or interrogator, the antenna permits the chip to receive, store or transmit information. The substrate is usually made of film and holds the pieces together as they are blended into the bar code label media. Intelligent labels vs. bar code labels. The intelligent labels look virtually identical to bar code labels. However, there are three primary differences that separate the bar code label from the intelligent label. First, bar code labels need a straight line of orientation and must not be obscured by dirt or grime. If dirt or grime blocks a clear view of the label, the scanner will not be able to read it. Intelligent labels need no special orientation, since the radio frequency portion of the label is what transmits the information. This information can be read from two inches or 40 feet away, depending on the technology used in the label. Read the rest of the bar code buster white paper.